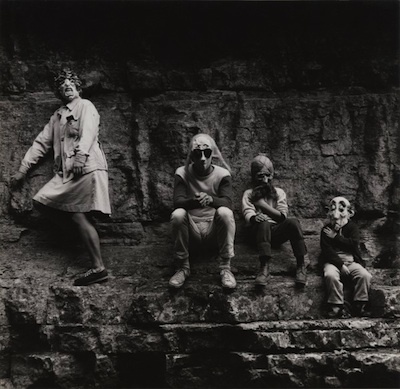 Dolls and Masks presents a collection of rare photographs by Ralph Eugene Meatyard made in the decade preceding the release of his celebrated body of work and monograph The Family Album of Lucybelle Carter. This book doesn’t have any of the problems you might typically find in a posthumous release. There aren’t any mediocre images from his B-roll, reproductions of his contact sheets, or prints that were never intended to see the light of day. These early works are engaging because they provide a glimpse into the mind of an artist as he developed a sophisticated visual vocabulary, and constructed the creative armature for an enduring masterpiece. Meatyard’s photographs in Dolls and Masks are born from a series of theatrical endeavors. He scouted locations well in advance and cast his children and wife in a series of tableaus. In one photograph, three children stand amongst the ruins of a dilapidated house. Their innocence and identity is concealed and distorted by grotesque rubber masks. A separate image depicts partially decomposed and neglected dolls, hidden or hiding in the corners of a forgotten home. It seems unclear if these toys are the residue of tragedy or serve as a harbinger of its imminence. The artist used mirrors and motion blur to create a surreal landscape and engage us in a psychological conversation with his subjects. His images begin to deconstruct our visual reality. Dolls and Masks contains fifty-five mostly unseen photographs from Meatyard’s early explorations as a serious photographer. His black and white images are pristinely reproduced and the volume is nicely bound with linen hard cover and dust jacket. The publication coincides with a traveling exhibition organized by the Art Institute of Chicago. Regardless of your level of familiarity with Ralph Eugene Meatyard’s work, you will likely find this book a valuable and intriguing addition to your library.